Immigration is currently transforming the American social landscape to a greater degree, arguably, than at any other time in U.S. history. Debates about the impact of recent immigration, mainly from Latin America, the Caribbean, and Asia, are highly contested. However, the key question regarding the long-term effects of recent immigration hinges not on how immigrants adapt but on how their children fare in U.S. society. Children of immigrants now account for almost 25 percent of all youths in American schools, and are the majority in many cities, such as Los Angeles. While the second generation — U.S.-born Americans of immigrant parents — as a whole tend to do as well or better in school than children of native-born Americans, disparities in educational outcomes by national origin are striking. On average, most national-origin groups from Asia tend to be more successful than native-born whites in terms of school performance and attainment. In contrast, most national-origin groups from Latin America tend to lag behind native-born whites in educational attainment and achievement. For example, in 2003, 32 percent of Asian high school graduates in California (the vast majority of whom are children of immigrants) were eligible to attend the University of California, compared to 16 percent of native-born whites and only seven percent of Latinos. A key question, then, is: what accounts for such dramatic differences in outcomes? Two explanations dominate today's debates. The first focuses on the role of cultural values, beliefs, and attitudes. Proponents of cultural views argue that children of immigrants from many Asian countries succeed in school because their families place more value on school achievement than other groups. The second explanation highlights the role of structural differences, such as class background and access to quality schools. Supporters of this view argue that differences in outcomes do not stem from culture because nearly all ethnic groups value educational achievement. Instead, disparities are due to inequalities in opportunities and resources. Critics of structural views counter that such explanations cannot explain why ethnic group differences persist even after accounting for differences in parents' educational attainment, income, and occupational status. Why are some groups able to overcome the barriers of poverty and low socioeconomic status while others cannot? One explanation may be that most researchers neglect differences in socioeconomic conditions prior to migration by focusing only on class status in the United States. Immigrants' class statuses after and prior to migration are often quite distinct. For example, some immigrants may experience downward mobility after migrating to the United States due to language and adjustment difficulties. Coming from a higher class position prior to migration may give some immigrant groups advantages that are not captured by typical measures of status in the U.S. context. Differences in adult immigrants' positions in their home country's socioeconomic structures prior to migration can therefore help to explain later differences among their children in the United States. How can we measure where immigrants were situated socioeconomically prior to migration? While we can estimate the absolute level of educational attainment immigrants had prior to migrating by using U.S. Census or survey data, that alone will not tell us about the relative levels of attainment immigrants had before migrating to the U.S., or where they were situated in the class distributions of their home countries. In fact, by only considering absolute levels of educational attainment, researchers inadvertently assume the same level of schooling in one country is equivalent to that level in another country. However, educational opportunities and distributions vary widely across countries. For example, the meaning of a high school degree in a country where only 20 percent of the population earns one is likely to be much different than in a country where over half the population not only earns a high school degree, but also goes on to college. To examine relative premigration levels of education among various immigrant groups, educational attainment data for immigrants in the United States must be compared to data from nonmigrant populations in their home countries. This is possible by examining census and survey data from immigrant-sending countries to the United States, which are available through United Nations publications, and examining comparable data on adult immigrants in the United States, which are available through the U.S. Census Bureau. 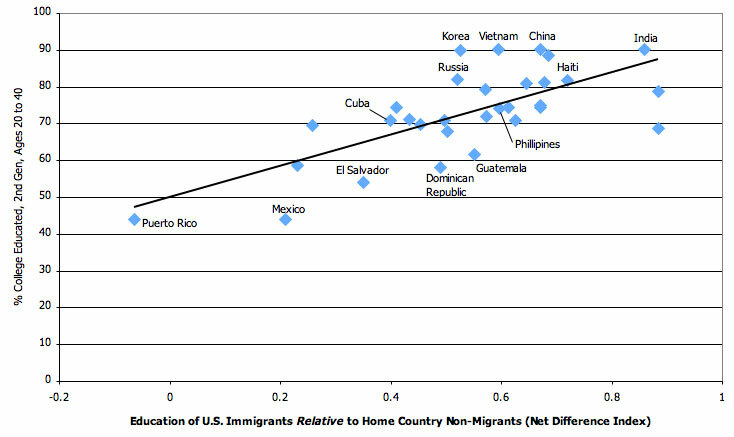 Using these sources of data, a measure known as the Net Difference Index, which summarizes how, on average, the educational attainment levels of immigrants compare to the levels in the home country, was constructed. This is a simple way of measuring relative premigration status, or from where in their home countries' socioeconomic distributions immigrants were drawn. Using Current Population Survey (CPS) from 1997 to 2001, the educational attainment of second-generation Americans was examined. To simplify the analysis, focus was placed on the percentage of second-generation Americans, ages 20 to 40, from each national-origin group who have completed at least some college schooling. Linking the various sources of data, it is possible to determine whether there is a relationship between the adult immigrants' premigration educational standing and the educational attainment of their children in the United States. Immigrants in the United States are more highly educated, on average, than those who remain in their home countries. This is the case for all of the immigrant groups examined with the exception of those from Puerto Rico (see Figure 1). Puerto Ricans who move to the U.S. mainland are less educated than those who remain on the island. However, of the 31 groups investigated, Puerto Ricans are unusual in that, as U.S. citizens, they face no barriers to entry. 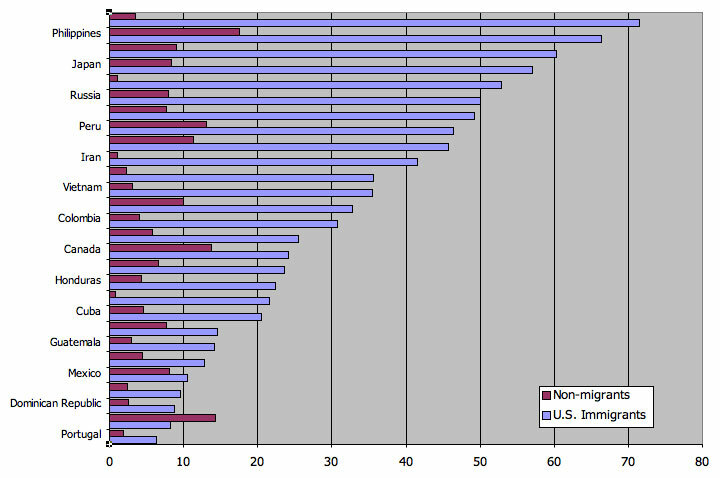 There is, nevertheless, considerable variation in the degree to which immigrants are more educated than nonmigrants. For example, the difference in the percentage of U.S. immigrants from India with some post-secondary schooling and the percentage of Indian nonmigrants with post-secondary schooling is tremendous: 68 percentage points. This translates into an educational attainment advantage among Indian immigrants to the United States that is, on average, over 20 times that of Indian nonmigrants. In contrast, the gap between U.S. immigrants from Mexico and Mexican nonmigrants is just over two percentage points. This indicates that U.S. Mexican immigrants are, on average, just 1.3 times as educated as Mexican nonmigrants. Therefore, the immigrants who come to the United States from India are from a more selective, even elite, class position than those who migrate from Mexico. In general, immigrants from countries farther away, such as those in Asia, tend to be more highly educated relative to their home countries' populations than those from countries closer to the United States. Importantly, some groups who are not well educated by U.S. standards would be considered highly educated in their home countries. For example, 21 percent of Haitian immigrants completed some post-secondary schooling. This is fairly low in the U.S. context, where over half the adult population has completed at least some college-level schooling. However, compared with the population in Haiti, where less than one percent of the population has attained post-secondary schooling, immigrants from Haiti are remarkably well educated. The question that remains is whether that relative premigration status drives their children's success in the United States. Educational attainment varies sharply by national origin among the second generation. 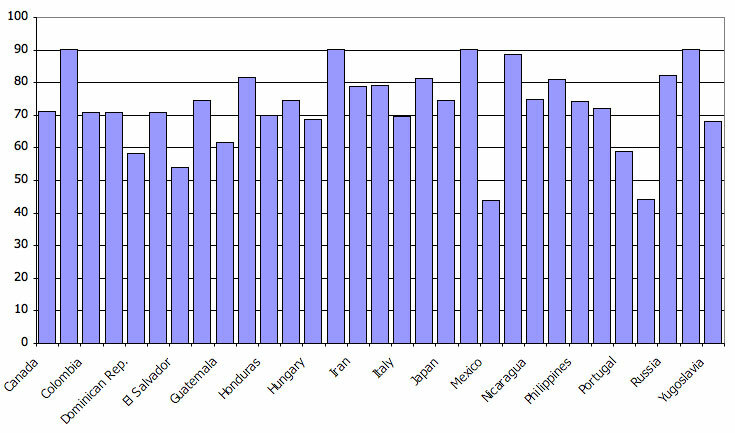 The percentages of adult second-generation Americans with some college range from over 90 percent for those from China, India, Korea, and Vietnam, to only about 44 percent for those from Mexico and Puerto Rico (see Figure 2). The puzzle is to understand why some second-generation adults whose parents do not appear especially well educated by U.S. standards nevertheless excel in the U.S. educational context. Does understanding where the immigrant generation was situated in the educational systems of their home countries prior to migration help us understand national-origin differences among the second generation in the United States? There is a strong relationship between the premigration class standing of the immigrant generation and the educational attainment of the second generation in the U.S. context (see Figure 3). College attainment rates are highest among the second generation from immigrant groups who had the highest premigration class status, regardless of their status in the United States. For example, the second generation from China, Haiti, and Vietnam, whose parents tend to be of low socioeconomic status in the U.S. but were of high status prior to migration, all have high college attendance rates. In fact, the average college attainment among groups with both high premigration and high postmigration status is 78 percent, while the college attendance rate for those with low socioeconomic status in the United States but who were of high status prior to migration is 82 percent. Thus, the more highly educated immigrants are in relation to the population in their home countries, the more successful their children are in the United States. This relationship is consistent regardless of the post-migration class standing of the immigrant group. In other words, even if an immigrant group is not well educated by U.S. standards or struggles economically, their children tend to do well in school if the group was of relatively high status prior to migration. Interestingly, premigration class status (measured in terms of relative educational attainment) explains more of the variability in college attainment among the second generation than postmigration class status. Premigration status alone accounts for over 50 percent of the variability in attainment among second-generation groups, while postmigration status alone only accounts for 41 percent of the variability. This does not mean that class background in the U.S. context is unimportant, however. Having economic security in the United States is certainly beneficial for children of immigrants, as sociologists Alejandro Portes and Ruben Rumbaut show in their book, Legacies. Instead, it suggests that both premigration class background and postmigration class background should be considered in understanding why some groups fare better or worse than others in the U.S. educational system. Taken together, the data show that both pre- and postmigration class status explain almost 60 percent of the differences in attainment seen among second-generation groups. Second-generation groups who perform the lowest are those whose parents are of lower socioeconomic status both in relation to U.S. levels, and relative to their nonmigrant counterparts in the home country. Only 61 percent of the second generation from these groups has attended at least some college. Differences in immigrant groups' class positions prior to migration produce ethnic disparities in educational outcomes among the second generation in the United States. This finding challenges explanations for ethnic group differences in educational success that favor cultural influences. The idea that certain national groups intrinsically value education more than others neglects the inequalities in the immigration process itself. Only select segments of any home country's population comes to the United States, and they are not necessarily representative of their national cultures. While this does not mean that cultural factors are irrelevant, it does suggest that cultural differences may ultimately stem from differences in premigration structural positions. Thus, rather than placing a higher value on education than others, some immigrant groups were of higher pre-migration status than others, an inequality which is reproduced among the next generation in the United States. Having parents who are highly educated, even if that education does not transfer into the U.S. context, can be a resource for the second generation. Not all immigrant groups start at the bottom, and researchers must go back to the place of origin to understand from what position each group is starting. This article is partially based on a paper published in the Winter 2005 issue of the International Migration Review. This article is part of a series on the second generation in the United States, supported in part by the Russell Sage Foundation. California Postsecondary Education Commission (2005). "Are They Going? University Enrollment and Eligibility for African Americans and Latinos." Feliciano, Cynthia (2005). "Does Selective Migration Matter? Explaining Ethnic Disparities in Educational Attainment among Immigrants' Children." International Migration Review 39, no. 4: 841-71. Feliciano, Cynthia (2005). "Educational Selectivity in U.S. Immigration: How Do Immigrants Compare to Those Left Behind?" Demography 42, no. 1: 131-52. Feliciano, Cynthi (2006)a. Unequal Origins: Immigrant Selection and the Education of the Second Generation. New York: LFB Scholarly Pub. LLC. Portes, Alejandro, and Rubén G. Rumbaut (2001). Legacies: The Story of the Immigrant Second Generation. Berkeley: University of California Press. Zhou, Min, and Susan Kim (2006). "Community Forces, Social Capital, and Educational Achievement: The Case of Supplementary Education in Chinese and Korean Immigrant Communities." Harvard Educational Review, no. Spring. Cynthia Feliciano is Associate Professor of Sociology and Chicano/Latino Studies at the University of California, Irvine.